No one under the age of 18 admitted! These topnotch crosswords with below-the-belt sensibilities will bring a smile to your lips and a blush to your cheek! 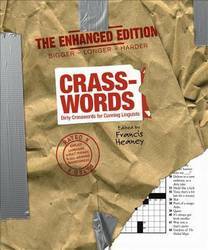 Adults with a racy sense of humor will love the irreverent, off-the-bathroom-wall themes and entries in this newly expanded edition of Crasswords: Dirty Crosswords for Cunning Linguists. Includes three cryptic crasswords full of devious wordplay and naughty innuendo.